Hagen Fluval 106-406 is a range of filters which do not differ from each other by their design or functionality, they are different only by a tank size where they can be installed. Fluval 106, 206, 306, 406 – are external canister filters of the 6th generation produced by Canadian company Hagen for saltwater and freshwater tanks sized from 25 gallons to 100 gallons. Fluval filters have been holding leading market positions for many years, namely the 6th generation has an obvious advantage over its precessors due to the number of improvements it has. They allow to insure complete 3 staged water filtration (biological, chemical and mechanical). At that the 6th generation filters are less power consuming, their capacity is 15% higher than their predecessors have. All spare parts and hoses needed to install the filter come in a set together with these filters. – also the unique design of the filter is a very important part of the filter improvements. This design makes the filter a very maintenance-friendly device, as well as it makes it highly all purpose device, since all complex and multistage filtration system is insured by separate steps each of which is set apart from the next one. – another innovative thing Fluval filter has is the upgraded Aquastop system due to which when detaching the hose and in case of high filter pollution the tank water is being blocked from flowing through the filter and this way it allows to avoid water leakage. – also the filter setup process has become less time consuming and the engine has been mounted more reliably – all these are due to the new filter clamps used. I’d like to describe in more details the priming system that has been improved and it’s much easier to run the filter. So, now to make the filter process your tank water faster and more actively you just have to make a few moves with a special start handle. As we have already mentioned Fluval filter of a new generation is of much larger capacity than its precessors, though power consumption is the same, at that water purification has become significantly better. All these became possible due to the filter design changes. Also these changes were made to spinner and rotor section cap (more efficient biological materials are now used in their design), due to what this filter model is much more noiseless. It’s worth to mention that the whole design of Fluval filter is now made from rather high quality details, which allows to insure its flawless operation through a long-term period. At that the filter is quite easy to assemble, demount and wash. Another one beneficial difference this model has is its improved system that allows to disconnect hoses fast and unplug the filter. Fluval 406 Hagen filter uses the following 4 sections for fillers: the first container is made for carbon bags and foam, the second one is for ceramic filler, the third one – for foam and the 4th one – is a container with coarse-pored filtering foam. To wade through all advantages and drawbacks of this filter we turned for advise to aquarists who regularly use it. I’ve been doing this job for over 10 years already. The majority of tanks I maintain are 100 and more gallons sized and they are using FX6 filters. However, there are tanks of smaller size, so I’ve seen quite a lot of filters. Earlier I used to work with Cascade external filters, but when Fluval came to the market I started installing them. 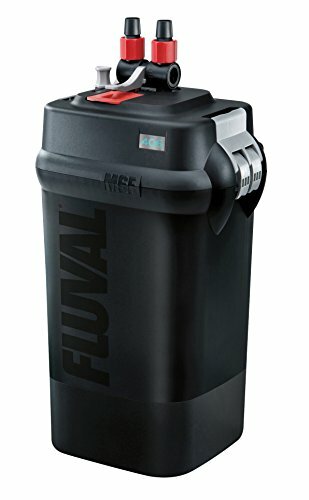 I have had no experience with mounting small Fluval filters, that’s why I spent some time digging into this new FLUVAL 406 filter to see its weak and strong points and to be able to advise my clients whether to buy it or not. Almost 50% of all fillers are Fluval Carbon. For a tank with cichlid fishes it’s more or less acceptable, but the filler has to be renewed regularly (once a month) and this means you need to buy new filler all the time (which is costly). For a planted tank you won’t need absorbent carbon, so it’s better to replace it with Fluval Bio-Foam or foam block. All foams in FLUVAL 406 are all brand-name product specially shaped and with some special structure. To replace them you’ll have to by the same original ones, which again is costly. As for the Cascade filter – you can put almost anything that fits into it. Fluval 406 has very few ceramic bio rings in it, which is rather strange for the filter with such characteristics. So, again, you’ll have to buy some more, to fill the basket properly. The filter rotor has rather thin ceramic pin. It is quite compactly sized. It is possible to choose the filter for any tank size, however, you have to keep in mind that its contracted capacity was given for completely empty filter. So, my advise is – always buy a bit oversized filter and you won’t regret it. Low power consumption level at high productivity. Quality hoses come in the filter set. The possibility to buy additionally some different filter fillers and almost any spare parts will please any user. If being compared to an internal filter, the main plus is that there is nothing bulky in a tank, besides the filter has better water filtration quality, it needs maintenance more seldom and the tank looks more stylish and modern with it. I bought Fluval 406 filter a year ago for 50 gallons tank with red-eared sliders. I chose this filter, since all external canister Fluval filters though they have smaller sized filler baskets due to their design are head and shoulders above other filters as for preliminary filtration space. There are 4 foams for preliminary filtration in Fluval 106, 206, 306, 406 external filters, FX 5 has even 6 of them. Since turtles are rather “dirty” animals, the main thing in the filter for turtles is mechanical filtration and only then come chemical and biological ones. Due to the large space of preliminary filtration this filter needs reassembling and washing more seldom. Fuval 406 was rather easy to start. Fast start system mechanism has worked perfectly despite its visual frangibility. My filter is on the floor (not in a closet) 2 meters away from a bed, but I barely hear it working. At night I only hear some nose like computer cooler is working, it doesn’t disturb my sleep. I started the filter with its original fillers and I’m very happy with a result. A few hours later the tank water became pure and colorless (I assume it was carbon filler work). In a word I have never seen my sliders’ tank that clean. However, before that I had Fluval 4 internal filter and it was rather powerful one, but in a week maximum it was completely filled with dirt and the tank water was always yellowish despite regular water renew. As for the fillers – there’s not enough of ceramic rings in the filter set to fill the baskets completely, so you’ll have to buy some more. In general, I can say that I’m very pleased with the filter for now. These are time proved filters and thousands of aquarists all over the world enjoy their work. Their basic configuration is rather poor and you’ll have to buy Pro Kit. However, this approach is common among all tank filters manufacturers. The filter has 3 year warranty and it means something. So, even if something goes wrong, it’ll be fixed. You’ll have to buy a bit oversized filter, even if it is written that this one will fit your tank capacity. This is the manufacturer’s trick – filter capacity indicated on a box is given for the empty filter. These filters are intended more for mechanical filtration, but you can improve the biological one after buying some wear parts for it. Furminator for dogs: the BFG of animal grooming!